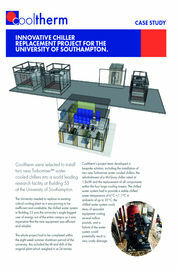 Cooltherm were selected to install two new Turbomiser™ water cooled chillers into a world leading research facility at Building 53 at the University of Southampton. The University needed to replace its existing critical cooling plant as it was proving to be inefficient and unreliable, the chilled water system in Building 53 was the university’s single biggest user of energy out of the entire campus so it was imperative that the new equipment was efficient and reliable. The whole project had to be completed within the eight week summer shutdown period of the university, this included the lift and shift of the original plant which weighed in at 24 tonnes. Cooltherm’s project team developed a bespoke solution, including the installation of two new Turbomiser water cooled chillers, the refurbishment of a McQuay chiller rated at 1.8mW and the replacement of all components within the four large cooling towers. The chilled water system had to provide a stable chilled water temperature of 6°C +/- 1ºC in ambients of up to 35°C, the chilled water system cools items of specialist equipment costing several million pounds, and a failure of the water system could potentially result in very costly damage. The project team also designed and installed a custom BMS control system to manage the operation of the chillers and all primary system components. This included 2 very large condenser water pumps, 3 large chilled water pumps, four cooling tower motors and overhauled the control strategy of all inverters to save as much energy autonomously 24 hours a day. With innovation at the heart of this development, it also included the first ever UK installation of the Geoclima evolved dual circuit cascade flooded evaporator, which pushes the efficiency of the already efficient Turbomiser chiller by at least another 7%. ‘The integration of all the primary chilled water system components (Cooling Towers, Pump, Inverters) along with being able to vary the water flows through the high efficiency Turbomiser chillers dependant on load and chillers operating made the whole installation one of the most efficient installations currently operational in the UK.